The northern coastal province of Quang Ninh is working on a pre-feasibility report on an undersea tunnel crossing Cua Luc bay, which will be the largest of its kind in Vietnam, according to the Government’s electronic newspaper baochinhphu.vn. The plan was discussed at an extraordinary meeting of the province’s People’s Council on March 14. Chairman of the council Nguyen Van Doc, who is also Secretary of the provincial Party Committee, told the meeting that besides the pre-feasibility report, the Government has also assigned the province to arrange capital for the project, which is expected to cost nearly VND9.8 trillion (US$423 million). Construction of the Cua Luc tunnel is projected to start this year and complete in 2024. The tunnel will be 2,750m long, running from Vuon Dao intersection in Bai Chay ward, Ha Long city, to the coastal road in Vinhomes Ben Doan urban area in Hon Gai ward, also of Ha Long city. 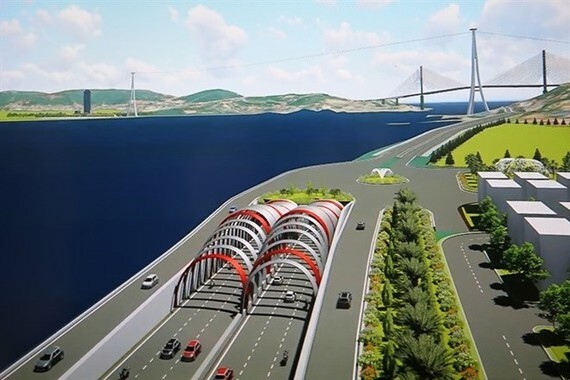 Built to cope with quake of up to magnitude 7, the tunnel will have six lanes for traffic, helping ease transport flow through the inner area of Ha Long city and facilitating connectivity between tourism destinations in the eastern and western areas of Ha Long. The official particularly stressed the importance of minimising the project’s impacts on the Ha Long Bay, local residents’ daily life and tourism and marine activities in adjacent areas.